Activists from People vs Barts PFI, together with Birmingham Keep Our NHS Public, Birmingham TUC Health Campaign and the local Green Party took their protest to Carillion’s AGM on 6 May 2015 – highlighting the company’s poor record and profiteering in the NHS. The protest was small but beautiful and clearly rattled the company. After some toing and froing with security guards, and initially calling the police, Board Chairman Philip Green even came out to talk to us – though he wasn’t thrilled to hear our view that PFI is creating a financial crisis in our hospitals and diverting money from patient care. Inside the AGM, our ‘shareholders’ ruffled feathers by asking pointed questions about the company’s catastrophically poor hygiene and employment standards at the Great Western Hospital in Swindon, and about their disproportionate profits trading equity in NHS hospitals. To our delight, a shareholder from a West Midlands pension fund also asked about Carillion’s involvement in blacklisting in the construction industry in the UK, while another asked about Carillion’s health and safety record in Qatar. Inside and outside the AGM, the Chair told us he hoped we didn’t think “PFI was our fault”, stressing that “PFI was not designed by us”. 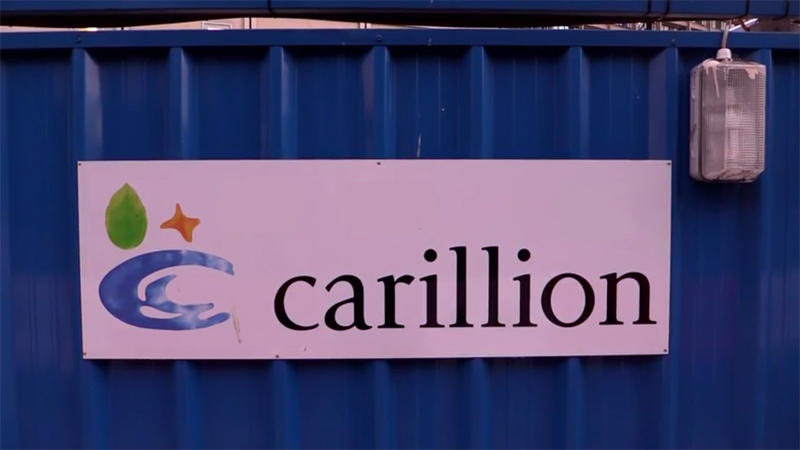 The company’s evasiveness over standards, wages and blacklisting – and the defensiveness over the PFI – told us all we need to know about Carillion’s company ethos and bad conscience over PFI. What has the Senior Management Team done to review and correct what has gone so seriously wrong at Great Western? A: The CEO attempted to minimise the complaint by claiming the food hygiene problem was about the temperature food was stored at. He seemed to have trouble remembering the dates and claimed that the issue had been dealt with. We repeated that the report by the CEO came out in September 2014 and had not been resolved. The CEO then hummed and hawed further and said they are continually monitoring standards. He promised, rather reluctantly, to look into reporting back on this to shareholders. Q: On your website, Carillion’s values are stated as: “We respect each other and we do things safely and sustainably. It’s good for our people, our business, and our local communities.” But at Great Western Hospital, 51 staff are taking Carillion to the Employment Tribunal, claiming race discrimination, bullying, harassment and victimisation. What has the Senior Management Team done to review and correct such a serious breakdown in employee relations? And what has Carillion spent to date on legal fees in challenging the action staff have taken? A: The CEO said this was a grievance arising from 2012 and claimed, implausibly, that it was all due to “Indian Christians all wanting to take three weeks off at Xmas, which wasn’t possible”. He had to admit the issue was serious enough to be going to a further Employment Tribunal later in the year. He sidestepped answering the question about legal fees. We then challenged him on the situation at John Radcliffe Hospital, where porters have had their wages and conditions cut. He tried to claim that Carillion has had to make changes to achieve ‘greater efficiencies’ – but he conveniently omitted to mention that the company has purchased a highly expensive electronic system, which is supposed to help the porters track beds and furniture round the hospital. Q: What arrangements does Carillion have in place to share gains from refinancing and equity sales with the hospitals it is in partnership with, and what % of the gains does Carillion intend to share. b) Carillion aim for a return of ‘only’ 15%, which is the market norm. He later claimed not to “recognise the figure of 50%” – (despite this being the figure identified by the National Audit Office in their analysis of Carillion’s Darent Valley PFI deal). c) Anyway, they now operate under the revised PF2 framework, under which the public sector can also invest in equity – but he implied public partners are often not keen on taking on equity and implied that under PF2 it’s OK for them to continue recycling equity at a big profit. Q: The questions on blacklisting and working conditions for the Qatar World Cup both received evasive answers. The blacklisting involved a ‘company subsidiary’, which has since been sold on – and blacklisting hadn’t been ‘illegal’ at the time anyway – but the company is compensating a number of people. No mention that others are going to the High Court. The Qatar ‘revelations’ in a Newsnight programme in December had really been about their sub-contractors. There had been problems with accommodation for some workers, but the company had now inspected the accommodation. This blog post is “not available” to share via your twitter button. When I attempted to reply on Carillion’s own twitter feed, about the volunteering hours their employees have done, it only posted after 3 attempts, instead my browser kept opening a new window with the original post and without your link to this blog.